Apparently 11 shutouts isn't enough. I guess an 8-10 record for a guy with a 3.31 ERA (Hamels) doesn't do it. 4 near no-hitters does not seem to say anything. To prove their clear apathy towards winning the division, the Phillies' offense has decided they simply will not hit in the first four innings. The Phillies have been no-hit through four innings in four of their last seven games. Fans and bloggers like myself are quick to call players lazy, heartless, and lethargic when they aren't hitting well. As Wheels often points out, "Nobody looks very energetic when they are making a right turn." Players can be putting in 10 hours a day in the batting cages, but we as fans wouldn't know that. All we can see is the results, and the results aren't very pretty lately. But when possibly the best National League offense over the last few seasons is unable to get a single base-hit, it is time to start the name calling. Lazy, undisciplined, arrogant, stubborn, selfish, apathetic. How does that sound? The Phils' consistent lack of offense indicates a team who doesn't have the fire to win anymore. If you disagree with me, try watching the Braves and tell me who the hungrier team is. Routine ground balls to second and short, contestant 0-2 counts, strikeouts, double-plays, and goose eggs under the "H" column all indicate a team who doesn't care much about winning. Hopefully this is just another case of a blogger who is unaware of what is happening behind the scenes. This time I don't think so. Domonic Brown has been labeled “untouchable” by Ruben Amaro and the Phillies as soon as he signed on the dotted line. He wasn’t a part of the Cliff Lee deal. Or the Roy Halladay deal. Or the Roy Oswalt deal. The Phils are clearly banking on Domonic Brown becoming a superstar. Domonic Brown certainly thinks he will be a superstar. But he is demonstrating that he is just not ready to play baseball in the Major Leagues yet. All of the reports claimed Domo was a very mature young man. Great words, indeed. It's not often you hear the word maturity linked to someone with the talent, tools, and promise of Dom Brown. Problem is, I sure as heck haven’t seen him demonstrate this maturity with the big club yet. The evidence so far suggests Mr. Brown has a lot of work to do before we can plug him into right field in place of Jayson Werth. Here are some examples. In his first game with the Phillies, he tried to make a diving stop in the ninth inning with a 7-0 lead and a shutout on the line for Halladay. I like the hustle, but he should realize that in this situation he's gotta let the ball drop in front of him. Later in his first game, he threw to third base on a ball that should have gone to second. Once again, he wasn’t aware of the situation. Brown misjudged more than a few fly balls already. And he catches balls in a funky way I haven’t seen before. It’s hard to tell if he is showboating or just has bad fundamentals, but no matter what it looks bad. And then last night was the worst of them all. He hit a ground-rule double and thought it was caught?! Are you serious?! How can a guy that should be trying to impress his teammates be so oblivious to what is going on? We saw Ryan Howard laughing into into his hat. But did you see the reaction moments before? There was clear rage on several Phillies players, including Howard as well as Jayson Werth. Oh boy. They say you only get one chance to make a first impression. Too bad for Dominic Brown. Charlie Manuel teams play well in August, and 2010 was no different for the Phils. The Phillies were 18-10 for the month and went from 3.5 games back and in 2nd place to sharing the lead with the Atlanta Braves. Not bad for a team that has been slammed with injuries and plagued with no offense for long portions of the season. August began as a terrific month for the Phillies. In July, after stumbling mightily with a 1-6 record directly following the all-star break, the Phillies caught on fire and won 8 games in a row. The Phils continued their hot streak into August by winning 5 in a row and 12 of their next 15 games, including a sweep of the Marlins in Miami and a series win over the Los Angeles Dodgers. Down 9-2 in the eighth, the Phils rallied for 4 runs in the eighth and 4 more in the ninth against Jonathan Broxton. Carlos Ruiz capped it off with an RBI single and now has 4 hits in 4 at-bats along with two game winning hits against Broxton in his career. It was also the 4th blown save for Broxton (two of them in the NLCS) against the Phillies in the last four years. The Phils followed up that great stretch 4 games later by falling flat on their face against the Houston Astros. They were swept in four games at Citizens Bank Park against Houston in a reunion of form Phillies with Brett Myers and JA Happ. A sweep at the hands of a last place club looked even worse considering the Phils had a 7 game west coast trip looming against the Padres, Dodgers, and Rockies. The Phillies would not hang their heads, though. They landed in San Diego and were able to sweep the National League’s best team en route to a 6-1 road trip that extended into September. Overall, it was another successful month for Charlie Manuel and the Phillies. Since 2005, Charlie Manuel has an 100-68 record in August. That is a .595 winning percentage, which works out to 96 wins over an entire season. It seems like clockwork with Charlie's teams in the second half. Jimmy Rollins is the face of Philadelphia, and in my mind the entire city of Philadelphia. Rollins was here when we sucked in 2001, when we were just competing in 2004 through 2006, and when we won the whole shebang in 2008. You have heard time and again from the Phillies, "As J-Roll goes, we go." We are constantly reminded of the statistics proving that when Rollins scores the Phillies win. It is also clear that Jimmy Rollins is the sparkplug for the team and a true leader in the clubhouse. Add to that the fact that statistically Jimmy Rollins is the second best fielding shortstop of all-time and you have the dream leadoff hitter. But Jimmy's drop off since his 2007 MVP season is alarming. Jimmy is batting just .256 since hitting .296 in the 2007 season. Nearly 3 years with a batting average barely above .250 for a leadoff hitter is certainly cause for concern. 1. It could mean that Rollins simply over performed in his early years and that the recent trend is more of what we should have expected from Jimmy all along. 2. Maybe it means that pitchers have adjusted to Rollins. With all the technology available, maybe the videos show clear tendencies in Jimmy's swing that pitchers are now able to exploit. 3. Or it could be possible that Jimmy is entering the downside of his career. Could Rollins be declining already at the age of 31? 4. Or maybe he's just had a tough couple years. He dealt with that terrible slump last year and then he got injured this year. Everyone goes through a rough spell at some point and this could be Jimmy's turn. Regardless of the reason, this is an issue that can't be ignored. As much as we love Rollins in this town, if this trend continues, we may need to consider life without J-Roll in the not-too-distant future. The numbers speak loudly to this point. These charts show Rollins' batting average per season and as well in spans of two and three years. No matter how you look at it, his numbers are moving very quickly in the wrong direction. Before we really hit the stretch run, I feel it is important to reflect on what the Phillies have accomplished to take a three game lead on the Atlanta Braves. I was listening to the radio and Scott Franske pointed out just how far the Phillies have come. On July 22 the Phillies were 7 games back of the Atlanta Braves and sat in third place in the NL East. Yet now they find themselves 3 back of the Phillies. Since their 7 game lead the Atlanta Braves have gone 28-25. That's not exactly a terrible record, but the Braves may not have been prepared for the freight train heading their way. That record isn't quite good enough when the team following you goes 38-15. That's right, the Phillies have played 23 games above .500 since July 22. That makes for a .717 winning percentage. Work that over an entire season and you get 116 wins. We have become accustomed to streaks like that with Charlie Manuel's teams, but that is pretty ridiculous. This is a really fun time to be a Phillies fan. The team is red hot with a 17-3 record in September and a 9 game winning streak. Best of all, the Phillies won the first two games in a huge late season series over the Atlanta Braves. The Phils have a 5 game lead with 10 games left. The Phillies entered the series needing one win and hoping to at least win the series, but here we are, one win away from sweeping the Braves and essentially sealing the fate of the Braves in the NL East. Ignoring the fact that we play the Braves 4 more times, if the Phillies go 5-5 the Braves would have to win every single game to tie the Phils for first. It feels right now that the Phillies should wrap this whole thing up in a day or two. Especially if the Phils win tomorrow they are in very good shape. As nice as those numbers sound, in order to relax the Phillies MUST CLINCH BEFORE BRAVES SERIES. The Phillies have a great chance now to rest some players. There is a good chance the Phillies will clinch before the Braves series, but what if they don’t? If the Phillies have to play the Braves in Atlanta, who knows what will happen? Not only will we need to play the Braves at Turner Field where they have the best home record in all of baseball, but it could completely screw up our plans to rest the “Big Three” and start the playoffs with our top guys. If we end up needing all three games, that would mean no extra rest for Halladay, Hamels, or Oswalt. Even worse, we might have to begin a playoffs with Kendrick or Blanton. To make a long story short, win now and the Phillies can rest their starters and set up the playoff rotation however they want. How about this for a controversial move? I heard quite an interesting idea this morning where a caller devised an intriguing option to free up the cash to keep Jayson Werth on the Phillies next season. Trade our starting shortstop? Former MVP? Longest tenured Philadelphia Phillies player? The sparkplug of the team? The guy who brought swagger to the club and kick started a possible 4 year NL East Championship run by telling the Mets we were “the team to beat”? It sure would take some big cajones to pull off a trade of Mr. MVP Jimmy Rollins. I can guarantee that fans would let Ruben Amaro understand in no uncertain terms their disapproval of the move. 1. There is no denying that Rollins has dropped off considerably in the last few seasons without any real signs of improvement. As I mentioned in a previous article on Rollins' serious decline, J-Roll is hitting just .256 since his 2007 MVP season. Frankly, Jimmy Rollins has not been a very good hitter for quite some time now. 2. Rollins is due to make nearly $9 million next season and Werth is probably looking to earn around $20 million next season. If you were to remove Jimmy's $9 million to Werth's current salary of $7 million it would come pretty close to covering Werth's asking price. 3. Wilson Valdez. In my mind, the one thing the Phillies would lose the most if they traded Rollins would be his defense. Rollins ranks second all-time in fielding percentage and that is something you cannot replace. But Wilson Valdez has show a terrific arm and is actually hitting better than Rollins this season. It's not like you are replacing Rollins with Juan Bell. 4. Rollins mentioned a long time ago that he would like to finish out his career on the west coast. If there is a chance J-Roll might leave on his own, at least in this case you would get something in return for him. That said, THIS WOULD BE A HORRIBLE IDEA. Even when he is not hitting, Jimmy brings so much to the table in other areas of his game. And the fact is, power outfielders are a dime a dozen and Dominic Brown is standing right behind Werth. With the Phillies magic number to clinch the NL East down to one, it seemed an appropriate time to recall recent NL East clinching moments for the Philadelphia Phillies. Let's begin our recap in 2007 with the first of what should be four straight National League East division titles. 2007 was undoubtedly the most unlikely, surprising, and remarkable of all the division titles. Trailing the Mets by 7 games on September 12, the Phillies began an amazing comeback while the Mets experienced possibly the greatest collapse in baseball history. Having already swept the Mets in a four game series at home in the end of August, the Phillies swept the Mets again in a three-game series in New York in the middle of a 12-4 record leading up to the final game. The Phillies found themselves tied in game 162 with the New York Mets. Even though the Phillies were red hot, the Philadelphia fan in me was certain that the William Penn curse would continue and the Phils would either lose in the final day or lose in a one-game playoff against New York if it came to that. Maybe William Penn loosened his grip on that Sunday afternoon because a Tom Glavine meltdown put the Mets down 7-0 before the Phils even began their game. I can still remember the final out of the Mets loss. Luis Castillo missed strike three on a ball in the dirt. True to the gutless team the Mets were, Castillo didn't even attempt to run to first base on what proved to be the final at-bat of their season. Now it was the Phillies' turn. The team leaned on Philadelphia's own Jamie Moyer to seal the deal. Moyer admitted he was nauseous the night before, yet still had a terrific outing under the greatest of pressure. Moyer pitched 5 1/3 innings and gave up just one run. The offense took care of the rest. The Phillies played textbook "small ball" to take an early 1-0 lead. Jimmy Rollins led off with a single, stole second base, moved to third on a Victorino groundout, and scored on a sac fly by Chase Utley. With a flare for the dramatic, Jimmy Rollins was not finished. With a 4-1 lead in the sixth, Jimmy batted with a runner on third. The fans were well aware that J-Roll was just a triple away from 20 for the season, so when Rollins slid in safely at third the fans went absolutely ballistic. That triple meant a lot, because it allowed Rollins to became the fourth player in MLB history with 20 doubles, 20 triples, 20 home runs and 20 stolen bases in the same season. Then we finally arrived to the ninth inning. Up 6-1 in a definite non-save situation, the Phillies still turned to closer Brett Myers. They were not going to let this one slip away. I'm sure every single Phillies fan knows what happened next with Myers throwing his glove to the sky and Pat Burrell barreling into big Brett. Although winning the World Series has infinite more value, I still believe that day was the single most exciting day in my life as a Phillies fan. To think what they had done to get to that point and with thoughts of another devastating loss at the end, to win it like they did was fantastic. The highlights of the Phillies clinching the NL East in 2007 still may give you goosebumps. After using an incredible comeback in 2007 to top the Mets in the NL East on the final day, the Phillies found themselves in a similar situation in 2008. Up by just 1 game in the second-to-last game of the season, the Phillies needed a win to seal the division title. As they did the year before, the Phillies turned to Jamie Moyer to wrap things up. Moyer took care of his part, giving up just one run in six innings of work. I personally don't remember much about the game itself leading up to the ninth inning, but few Phillies fans will forget the way it ended. The Phillies had a 4-2 lead in the ninth and Brad Lidge on the mound. The inning did not go well for Lidge and after giving up an RBI single, he had runners on first and third with one-out in a 4-3 game. Flashes of disaster came across my mind at that point. Lidge had not blown a save all season, so to blow the lead in the most crucial of games would immediately prompt reporters to remind Lidge of the home run he allowed to Albert Pujols that lost the NLCS for the Astros. 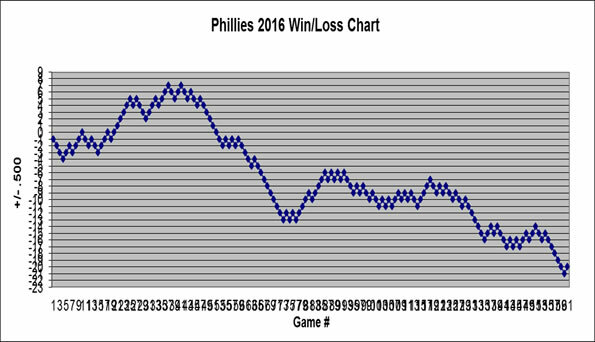 Looking back at it, if the Phillies had lost that game, the very well might have not won the World Series. If they lost that game, Cole Hamels would have pitched the final game. Why would that matter? Hamels pitched and won the first game of every playoff series in 2008 - this would have completely disrupted the rotation. But Ryan Zimmerman helped make all of those scenarios meaningless. Needing a strikeout, double-play, or maybe even a miracle, Zimmerman hit a hard grounder up the middle. Cheating up the middle, Rollins made a diving stop, tossed it to Utley, who threw it to Howard to clinch the game and the division. My heart felt like it dropped into my stomach when Zimmerman hit that ball, but to see Rollins slide across to start the double play still feels like a dream. An amazing end to the season and the start to a pretty amazing playoff run. If you feel nostalgic, take a look at the final play to clinch the NL East in 2008 here. Who do the Phillies want to face in the NLDS: Giants, Padres, or Reds? Now that we know the Phillies are in the playoffs and have the best record in the National League, the question now is who will we play? Since teams cannot play another team from their division in the first round, we know the Phils will not play the Braves. That leaves us with the Reds and either the Padres or the Giants (depending on how the NL West and Wild Card plays out). 1. On paper the Giants are the better team than the Padres. They rank first and second in pitching, but the Giants are middle of the pack offensively while the Padres are towards the bottom. 2. The Reds are essentially the reverse of the Giants in that they are tops in batting and right in the middle in pitching. These number make it obvious that you will eliminate the Giants because they have similar rankings to the Padres, yet are better in all areas. So the question boils down to whether or not you would like to play against the top offense or the top pitching. But what may matter more than the above information is how the starters match up. Listed below are numbers of the likely starters from each team and how we fared against them this season. When you put those numbers together the Phillies ERA is 2.02 higher than the Giants, 2.53 lower than the Padres, and 1.69 higher than the Reds. Therefore, the numbers scream that THE PHILLIES WANT TO PLAY THE SAN DIEGO PADRES. The next best team to face is the Giants. Even though we had a better record against the Reds and our numbers are a bit better, the fact that the Red's starters pitch well against us scares me. The strength of the Reds is their offense, but if their starters are effective against the Phillies we might be in some trouble. We finally know who the Phillies will play in the NLDS: the Cincinnati Reds. The popular opinion is that the Reds are the perfect matchup for the Phillies in the first round. The Reds probably are the best choice, but don't think we will walk away with this series just yet.